Apple’s hotly anticipated iPhone X release is now just three weeks away, with the phone set to hit store shelves on November 3rd after a week of preorders that open on October 27th. We’ve seen countless reports that suggest tens of millions of Apple fans too a pass on the iPhone 8 and iPhone 8 Plus, waiting instead to get their hands on the first redesigned iPhone the world has seen since all the way back in 2014. Now that the iPhone X has been announced, Apple has apparently given its employees around the world the go-ahead to use them in public. We’ve also seen dozens of photos of the iPhone X in the wild, since eager Apple fans have been snapping pics whenever they see one. These photos are generally pretty boring, but the latest one to hit the web actually draws attention to an issue that is going to annoy iPhone X users for quite some time following the phone’s release. No, we’re not talking about the ears on either side of the “notch” at the top of the iPhone X’s display, though those are indeed quite annoying as well. The iPhone X’s ears are a permanent fixture — they might be ugly to some, but they’re not going anywhere anytime soon. In fact, Apple is insisting that app developers embrace the notch in many cases, rather than trying to hide it with creative interface tricks. In this case, we’re talking about the new aspect ratio of the iPhone X’s 5.8-inch display. Let’s take a look at the photo in question, which was posted on Reddit last night. 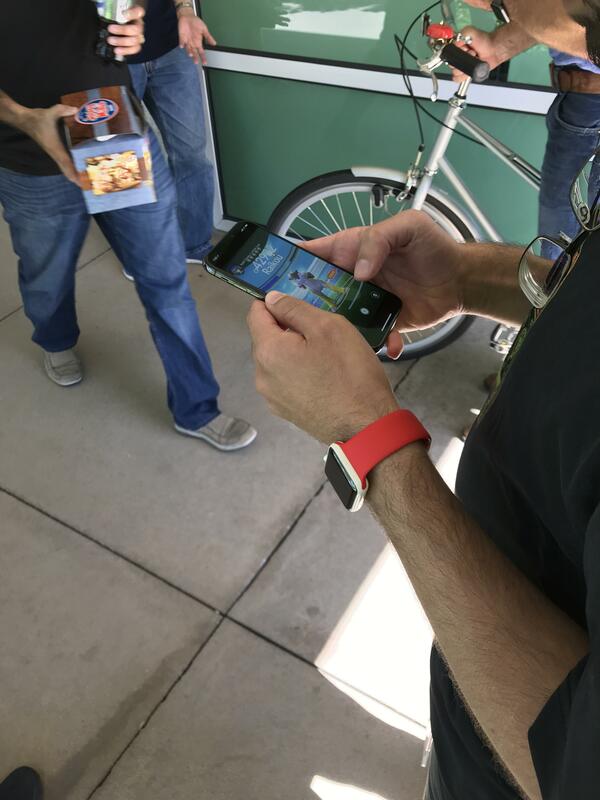 Here we see a presumed Apple employee playing Pokemon Go on his iPhone X. No, it’s not specifically Pokemon Go that we’re concerned with. Click on the photo to open it in a new tab at its full size, and then zoom in on the phone. Now look at the top of the phone. See where the app UI ends? See how it’s nowhere near the top of the screen? Yeah, that’s a problem. Because Apple’s new iPhone X features a much narrower aspect ratio than the rest of the iPhone lineup, apps aren’t going to take up the full screen unless they’re reworked a bit by developers. Instead, they’ll shrink down to fit on the iPhone X’s display at their proper aspect ratio. Despite the fact that the X’s screen is larger diagonally than any other iPhone, it’s quite narrow compared to other iPhones. As a result, apps that aren’t updated are going to be pretty tiny compared to how they appear on other iPhones. It’s not the end of the world and for most apps it should only be temporary until developers push out updates, but it’s something to be aware of so you’re not unpleasantly surprised next month. Is Razer about to launch a modern PlayStation Phone to take on the iPhone?